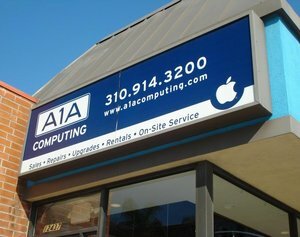 A1A Computing is proud of our solid foundation. As we were incorporated in 2007 as a service provider and retailer, we are a neighborhood staple on the West side of Los Angeles. In the past 8 years, our solutions have become wide spread and more brand agnostic, but it is our ability to determine, employ, and accommodate you with just the right products and services to meet a new horizon of technology needs and challenges that has built our reputation. Adapting our business as the advances, demands, and integration of technology have evolved, has given us the perfect timing to understand and meet individual needs with equal insight and experience. We stock a wide variety of used Macs and configurations, hardware, and accessories. We also offer rentals and support to a loyal customer base. While technology solutions comprise a majority of A1A Computing’s efforts, service remains at our core. But service has taken on a far more creative definition, as we not only manage, but design and configure the deployment of technology—in ways we barely imagined only a few years ago. We offer integration services as well as support contracts so call or email today to learn more.